Although "new" in name, HAXXAN features underground legend Killjoy DeSade (Necrophagia, The Ravenous, Wurdulak, et. al.) on vocals and synth. Formed in 2011 by Killjoy and guitarist Shawn Slusarek, the duo decided to write material that had an old-school black metal vibe, citing such influences as Beherit, Archgoat, and Blasphemy with hints of Candlemass and Mercyful Fate. The duo then added bassist Jake Arnette and drummer Serge Streltsov, and soon recorded their debut album, Loch Ness Rising. Spread over 10 tracks, HAXXAN's Loch Ness Rising is conceptually based on Aleister Crowley, as Killjoy has been a life-long Crowley enthusiast. 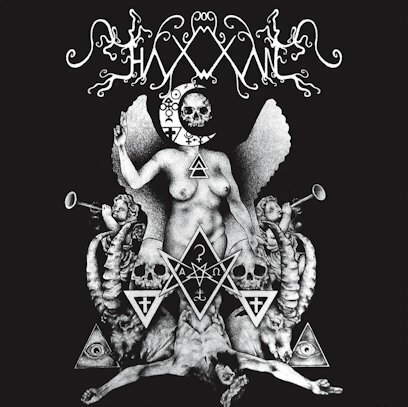 As a full-band unit, HAXXAN soon celebrate the life, works, and magick of Crowley through patiently unfolding vistas of doom and dread, eerieness and unease. Recorded at Thelema Studios and mixed/mastered by Grzegorz Kulawiak at Sin Mix Studios, Loch Ness Rising richly resonates with a pure (and purely eerie/uneasy) tone that lends these songs a unique character: undoubtedly heavy in a manner not unlike To Mega Therion-era Celtic Frost, there's likewise a ghostly aspect to its conversely crushing stomp. As expected, Killjoy delivers a peerless performance, stretching all extremes of his twisted 'n' tortured throat, almost narrating the slowly enveloping fog of unearthly horror. Taken together, Loch Ness Rising is an experience both atmospheric and caustic, bleeding black blood and drinking it from a ceremonial cup - just as Crowley would've wanted it.